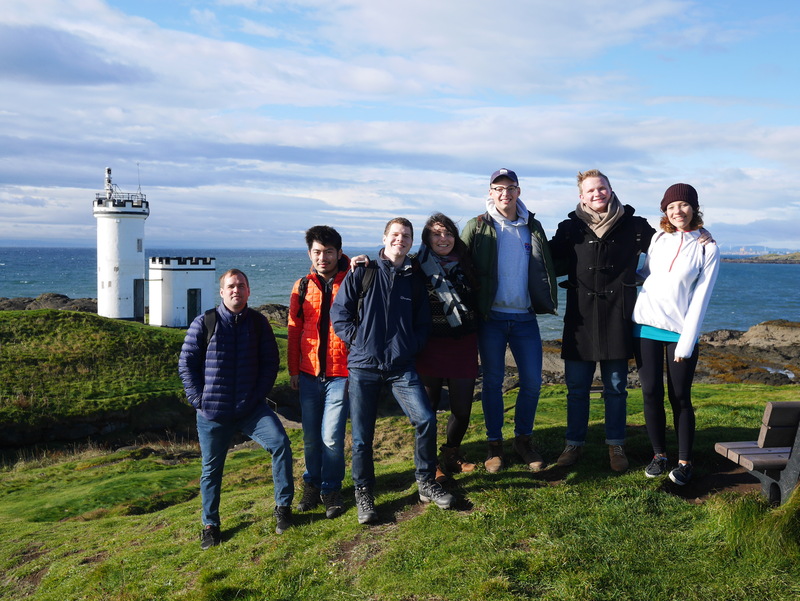 In October, our masters students studying transnational and spatial history in our MLitt programme took a break from their research and seminars for a day long walk along the southern coast of Fife from Elie to Crail. A new tradition in formation, this was the second cohort of masters students to make the journey along with programme coordinator Konrad, which this year added new elements, including a picnic and student-supplied whisky in St Monans harbour, a stop for hot chocolate and historical discussion in the village of PIttenweem, and fish and chips in the final village Crail, which a recent blind taste test by postgraduate students give winning scores to, despite the greater fame of its rivals in Anstruther. Whisky fortification for the last leg of the walk between Cellardyke and Crail. The Isle of May is in the background. St Andrews is located on the northern side of Fife, but is a convenient bus ride from all the coastal villages further south that can all be reached by following the Fife Coastal Path. The stretch from Elie to Crail is especially stunning, and a walk beginning in Elie at 10:30am can end in Crail by dinner time, with plenty of time for breaks in the villages along the way. 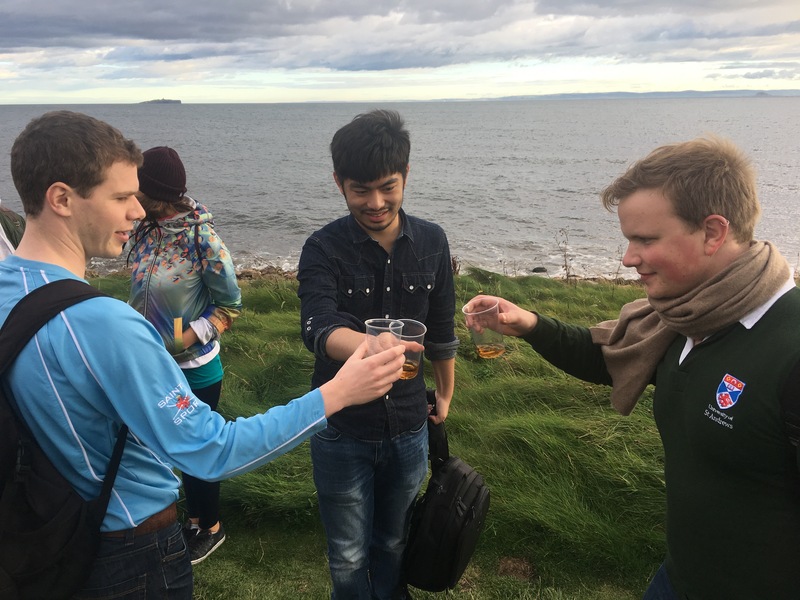 Walks like these are perfect ways for postgraduate students to get to know each other better and explore what Fife has to offer. This posting is the first of three offering a reading of the work of the geographer Yi-Fu Tuan from a historian’s perspective. I hope to follow it with a series of similar postings on other scholars that may offer us productive ways to think about spatial history, or in other cases, avoid some of the pitfalls along the way. Historians who are interested in issues related to space are presented with a bounty of potential inspiration when it comes to theoretical work, much of which will draw them to reading works outside their own discipline. Philosophers and other thinkers who fit uncomfortably into any single disciplinary category are found in great number, while perhaps the most intuitively natural disciplinary home for thinking about space, geography doesn’t have much claim to a monopoly or dominance. If we take one volume that explores some of the most influential thinkers, Thinking Space (2000), for example, we find that both the editors, Mike Crang and Nigel Thrift, and a majority of the work’s authors are themselves geographers or find their institutional home among them, but not a single one of the sixteen thinkers considered by its chapters are. The Sage collection of 66 essays introducing Key Thinkers on Space and Place delivers a slight majority of its pieces on geographers, but also reveals the impressive interdisciplinary range of scholars who have made important contributions to thinking about space. Below I want to introduce Tuan and what draws me to his work. I will devote a second posting on Tuan to consider him more critically, focusing on two features that I suspect many historians would find troubling: the relative little attention to change on the one hand, and to either human agency or social structures in bringing about the spatial practices that he describes. Finally, in a third posting, I want to say a bit more about the style of argument that Tuan uses, his consistently concrete, empirical, and engaging writing style, and then revisit some of the features of his approach that I think continue to make him interesting to read today. In this manifesto for a field of geography Tuan speaks confidently of it in terms that suggest it already exists, and in a sense it was beginning to. Edward Relph’s similarly inspired Place and Placelessness comes out the same year with a complex framework and analysis of the “modes of spacial experience” while Anne Buttimer’s work would count among the humanistic geographers of the decade. Like Relph, Tuan describes the practice of humanistic geography in phenomenological terms but conflates this as the fruitful gamble of the humanist approach in general, “The humanist runs the risk of paying excessive attention to beginnings,” a phrase which could have been easily found in the opening pages of Bachelard’s The Poetics of Space, where he describes his phenomenological approach to space as, “a consideration of the onset of the image in an individual consciousness” or later phenomenology of space an approach which “liquidates the past and confronts what is new.”4 This was not the first time Tuan had written like this: in an also widely cited 1971 article on geography, phenomenology, and human nature, Husserl, Merleau-Ponty, and indeed Bachelard’s Poetics of Space itself all make their appearance but without any engagement with any of their ideas in detail.5 In this earlier article we find his goal stated in its boldest and perhaps most problematic early version: Tuan believes that a phenomenological approach will allow the identification of human essences, and allow for a “geography as the mirror for man” or which “reveals man” (by now you will have spotted the gendered nature of these identifications). Whereas Bachelard offers corners, miniature, and shells, for example, Tuan in this article suggests exploring the spatial secrets of “back” and “front,” of “home” and “journey” (in Space and Place one can find way stations between these two as critical) among others, and suggests that only by looking at humanity’s basic responses to the world through spatial concepts such as this will a geographer capture things which statistic approaches fail to deliver, as when, for example, one attempts to use statistics on visits to nature parks as a measure for human interest in nature. So what drew me to Tuan’s work if, in some sense, the peak of its particular approach came in the unique moment of disciplinary transformation within geography of the 1970s and was then absorbed and developed in new decorations in the decade that followed? A few of the things I found most impressive were: 1) the inspiring breadth – pick up a work by Yi-Fu Tuan and flip through it, not even skimming full sentences, and you will be immediately struck by the sheer cosmic scale of his approach. He shifts smoothly from quoting Kant on the heavens to the spatial practices of Eskimo on the hunt or describing the ventilated homes of termites – all in a way that never looses the plot. We’ll come back to the dangers of this kind of approach, but the experience for the reader is breathtaking and sets the mind on fire with ideas. 2) the range of sources – a related point are the sources he draws this from. A good majority comes from anthropology, but psychology, architecture, literature, philosophy, and the hard sciences are all taken up and woven together in an impressive way and brings me to 3) the readability – many of the ideas that Tuan is interested in are abstract, such as the experience of time, the ability to perceive and analyse space and the relation of this to culture, but Tuan’s works are extremely readable, not only accessible to a general reader, but it is, I would argue, possible to pick up Tuan at any point in his Space and Place and almost immediately be pulled in. While I very often found myself protesting at the conclusions Tuan is drawn to, I think there is considerable value in the way that the highly concrete examples Tuan uses continually provokes the reader to engage in reflection. Even if that reflection results in protest, it often inspires new ideas for a researcher. Enough for now, but in the next posting I’ll consider Space and Place in more detail and turn to some of its problematic aspects. 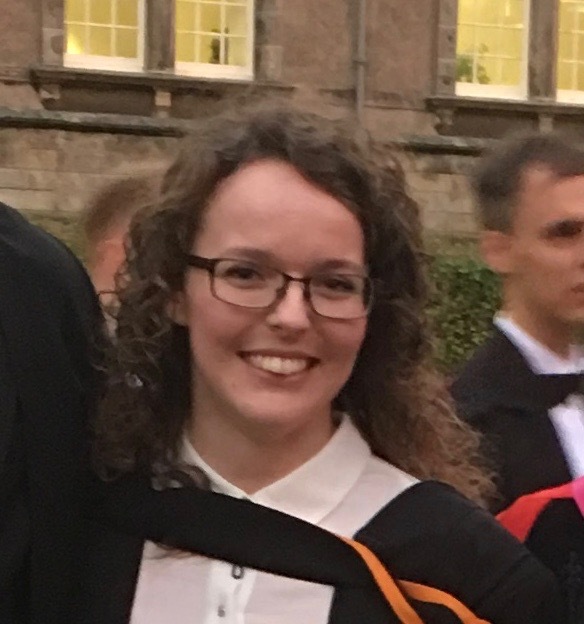 This guest posting is by Katherine Bellamy, who completed the MLitt in Transnational, Global and Spatial History in 2016 with the dissertation “Ninnimissinouk Networks: The Endurance of Identity in a Transnational Context.” Katherine showed particular aptitude and a well-rewarded curiosity in the skills component of the programme, and made use of geographic analysis, network visualisations, and also impressively mastered some particularly challenging ‘regular expression’ high wizardry to extract and clean data from historical databases. We have invited her to share her experiences. The Skills in Transnational History module proved to be a valuable opportunity for me to explore my interests in the digital humanities, in a way which complemented the broader themes of transnational history. We explored numerous avenues open to historians wishing to pursue digital methods, including the use of GIS (Geographic Information Systems) software as a tool for analysing historic and geographic data. Having previously used GIS myself, though in a purely geographical context, the opportunity to use this tool in a historical context was of particular interest to me. 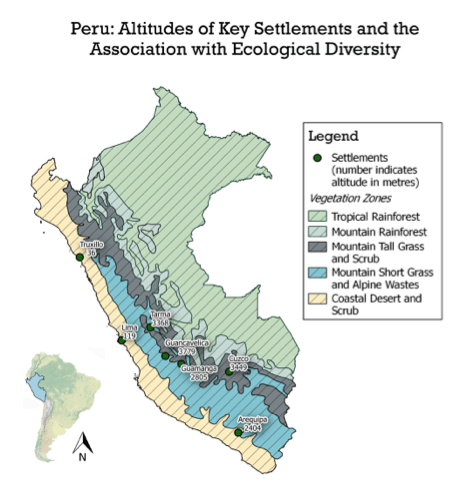 My first project for this module aimed to present John Murra’s theory of the ‘vertical archipelago’ in the Andes with a GIS map. I had initially planned to utilise both climatic and agricultural data from Alexander Humboldt and Aimé Bonpland’s 1805 map, Géographie des Plantes Equinoxales, but ultimately chose to omit the agricultural data as there was no clear way to show the significant variations across different altitudinal ranges. This meant I was unable to clearly demonstrate Murra’s link between the varying agricultural production zones, ecological zones, and settlements as I had first hoped. 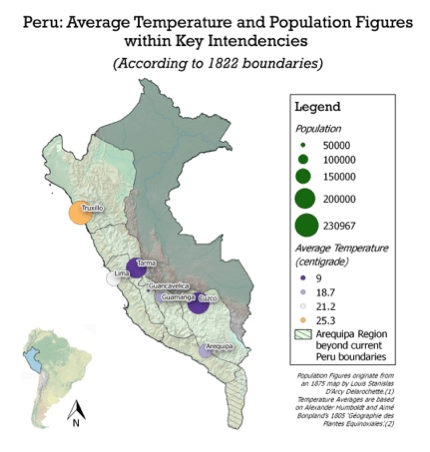 The first of my final maps depicted the average temperature and population figures within key intendancies, aiming to demonstrate any correlation between population size and environmental circumstance (though the result suggested large population sizes could be sustained at both ends of the spectrum); the second map depicted the altitude of the cities associated with the intendancies of the previous map, alongside the varied vegetation zones within the Andes. These maps drew on various sources, including the aforementioned 1805 Géographie (providing temperature data); an 1875 map of South America authored by Louis Stanislas D’Arcy Delarochette (from which I identified the intendancies/cities depicted on the maps); and an 1822 map of Peru which I georeferenced in order to establish accurate contemporary boundaries. 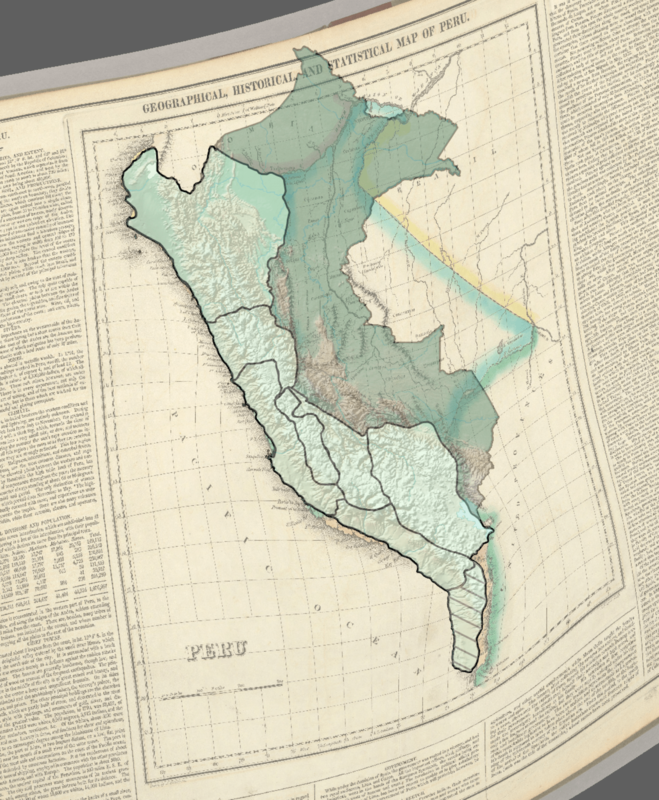 Whilst the georeference was not entirely precise, it allowed me to create an additional polygon within the GIS software to represent the area of the Arequipa region which previously extended beyond current boundaries. Neither map is by any means perfect, both as a result of inherent issues with map creation (all maps lie! ), as well as the broader problems associated with utilising largely qualitative historic data in a quantitative setting. The lack of detailed, accurate quantitative data created difficulties throughout the process of creating these maps. Good data is of the utmost importance when pursuing these research methods. For the second assignment, which focused on the application of other key skills learnt in the module – namely the creation of relational databases and/or social network analysis – I was able to utilise data which was more appropriate. The source of my basic dataset was a list of 2,855 employees of the Hudson Bay Company (roughly ranging from the mid-eighteenth to mid-twentieth centuries), which included employee names, dates of birth, dates of death, and dates active with the HBC. This relatively rich dataset offered the potential for a substantial database, and even some network analysis. However, the amount of information available for each employee varied significantly, nor was the ordering consistent. As such, I utilised regular expressions in order to limit my selection to only those employees who had complete date ranges, and then further narrowed my selection to include only those active between 1821 (when the North West Company and HBC merged) and 1860. I was left with a list of 211 employees, and pdfs corresponding to each employee with further biographical details and their various postings with the HBC. Inputting all this data into a LibreOffice database, I created a form linking the basic biographical information (obtained from using regular expressions) to the more detailed position information (from the pdfs). On a larger scale, a digital humanities approach could yield valuable results, through the creation of a searchable database, displaying biographical information alongside each individual’s career history with the HBC. I had personally hoped to create some form of social network graph utilising this data, but was unable to do so due to time constraints and the nature of the data. Instead, I used the data to create a series of QGIS maps which depicted key HBC post locations, and how frequently these posts were mentioned over the course of the nineteenth century. Whilst I was faced with obstacles which often prevented me from achieving what I had initially planned to show, the process of dealing with these challenges in this course proved immensely useful for me. Not only did it demonstrate the challenges faced more broadly by historians wishing to adopt digital humanities methods, it also improved my knowledge and understanding of these tools, and, critically, the best way to utilise them. The digital humanities have been viewed with a certain degree of scepticism, yet it is important to recognise that, when applied correctly, the results of adopting these tools can be extremely rewarding. Ongoing projects such as Stanford University’s Spatial History Project, and the University of St Andrews’ own Digital Humanities Network, continue to demonstrate the value of adopting this interdisciplinary approach, utilising innovative methods to yield results which enrich historical enquiry. My experience as a former student in the MLitt in Transnational, Global and Spatial History has been highly positive because of the welcoming environment, the stimulating style of teaching (and learning) and the fitting training it provided to meet the challenges of 21st History writing. To start with human relations, in my view the friendly course’s staff attitude towards students was both able to mitigate stress from academic work and boost the quality of scientific output. In fact, being treated on an informal and equal basis worked for me as a strong incentive and help to overcome initial anxieties, insecurities and obstacles that derived from being accustomed to a totally different educational system. Moreover, the Master’s experience proven to me just how much the quality of research also depends on the quality of dialogue with other scholars. Therefore, a welcoming environment such as the one that is found at the School of History in St Katharine’s Lodge was also conducive to raising the level of one’s scholarly performance. A second major strength of the Mlitt, which is solidly grounded on its friendly atmosphere, is its style of teaching, which is based on discussion and collaboration as an approach for progressing in historical research. Classes, seminars, writing workshops and “surgery hours” have been fruitful moments of debate with lecturers and other students. It resulted very often in the development of new ideas or the refinement of old ones. The countless chances for dialogue offered by the programme – even in form of one-to-one conversations – profoundly contributed to my intellectual progress. Finally, the formula could not have been completed if the relaxed, fertile atmosphere and the attention to dialogue had not been combined with a serious training. This included, amongst others, an emphasis on theoretical approaches to history, the teaching of cutting-edge methodologies and the study of a very large set of subjects. Particularly, the considerable importance given to theoretical issues made me fully aware that historical writing must first and foremost include a strong reflexive component. Also, research about the past is a practical undertaking and the introduction to innovative methods such as the ones connected with digital humanities (maps and databases) kept me and my colleagues in pace with the on-going, rapid transformations that the discipline is experiencing. Finally the multiple geographical and thematic areas covered by the Mlitt’s lecturers are important tools for becoming global and/or transnational historians in the full sense of these words. Indeed, I think that these approaches require intellectual curiosity and the will to find inspirations in realms which are (even if only apparently) far away from one’s own interests. After this year in the MLitt, I am persuaded that the combination of each of the abovementioned elements has positively influenced my evolution as a scholar. As a result, I would highly recommend the master program to anyone who, like me, intends to pursue a career in historical research. The workshop will include Jürgen Osterhammel (University of Konstanz) and Geoffrey Parker (The Ohio State University). Graduate students at Scottish universities are invited to participate in a one-day workshop on Saturday, 4 June 2016, organized by the Scottish Centre for Global History at the University of Dundee. The workshop theme is “Writing Global History and Its Challenges.” Professors Jürgen Osterhammel (University of Konstanz) and Geoffrey Parker (The Ohio State University) will assign readings in advance of the workshop, and lead the discussion. 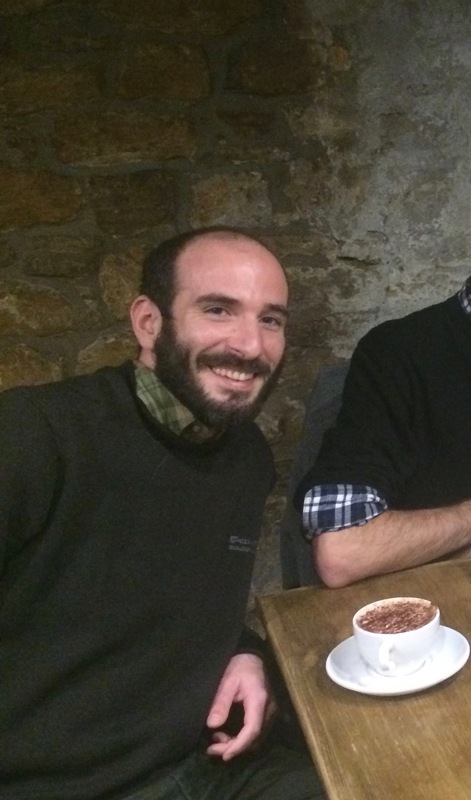 The workshop is free of charge for graduate students at Scottish universities. However, places are limited. In order to reserve your spot, you need to send an e-mail to Dr. Martine J. van Ittersum (m.j. vanittersum [at] dundee.ac.uk) by Monday, 9 May 2016, at the latest. The e-mail should include a one-page CV and a one-page summary of your research interests (500 words maximum). Please do not wait with submitting your materials until the last possible moment. You may be disappointed. You may now watch videos from the 29 May, 2015 conference Between Federalism, Autonomy and Centralism: Central and Eastern Europe in the 20th and 21st Centuries which we have written about here previously.